The veterans affairs minister says he's "proud" of efforts. Afghanistan veterans, retired Cpl. Aaron Bedard, right, and retired Major Mark Campbell pose for a photo in Ottawa on Jan. 31, 2018. 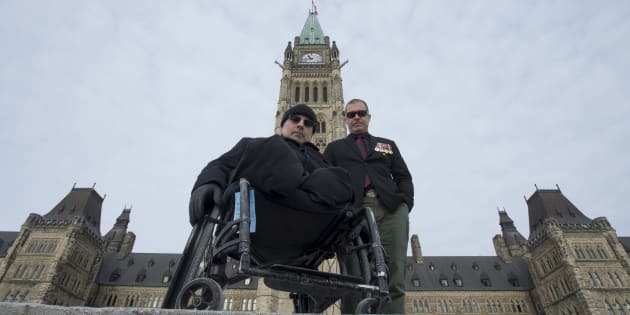 OTTAWA — A group of six disabled veterans wants the Supreme Court of Canada to weigh in on their fight with the federal government over the re-introduction of lifetime pensions for those injured while in uniform. The request is the latest twist in what has become a five-year legal battle that saw the veterans score an early victory against the government, only to suffer a setback at the B.C. Court of Appeal, which threw out the lawsuit last month. It also comes despite the Trudeau government having recently unveiled its own version of disability pensions, which have been widely criticized by the veterans' community. "What's a fundamental Canadian value? Fairness. Justice," retired major Mark Campbell, who lost both legs to an improvised explosive device while serving in Afghanistan, told a news conference Wednesday. "Well, there is none right now within the veterans' community and its dealings with the government of Canada." The case, known as Equitas, revolves around a 2006 decision by all federal parties to replace lifelong pensions for disabled vets with a single lump-sum payment, career training and targeted income-replacement programs. The veterans involved in the lawsuit allege those changes discriminate against today's service members because the previous pension system provided about 40 per cent more financial compensation over a lifetime. The lawsuit was launched in November 2012 and received a major boost after a B.C. Superior Court judge ruled in September 2013 that the suit could proceed, despite fierce resistance from the Harper government. The Conservatives appealed that decision to the B.C. Court of Appeal, but also started talks toward a possible settlement. Both the appeal and the settlement discussions were suspended in advance of the 2015 federal election. But the Liberals restarted the appeal after taking power and scored a major victory when the appeal court ruled on Dec. 4 that the lawsuit had no chance of success. A few weeks later, the Trudeau government rolled out its own version of disability pensions. But those also have been criticized for offering less compensation to the majority of injured veterans than the pre-2006 iteration. All of which set up Wednesday's request for the Supreme Court to hear the case and decide whether there is enough merit in the veterans' arguments for it to proceed to an actual trial. Veterans Affairs Minister Seamus O'Regan declined to comment Wednesday on the latest developments. "We are very proud of the efforts that we've made for veterans over the past two and a half years, especially in the last couple of months," he said outside the House of Commons. "The Supreme Court will make a decision on whether or not they will proceed, and we await that decision." The veterans involved in the lawsuit say they are simply trying to ensure all veterans are treated the same, and feel betrayed by the Liberals, who promised to reinstate the old pensions during the last election. "We're not in it for anything other than to make sure that this gap that's been created gets filled," said retired corporal Aaron Bedard, who was also injured while serving in Afghanistan. "In 'Soldiering 101,' when there's a gap in an advance, we'll make sure that the people who are coming behind us are going to be able to make it through there."